How to redeem ATS Operation Big Sur Reward? 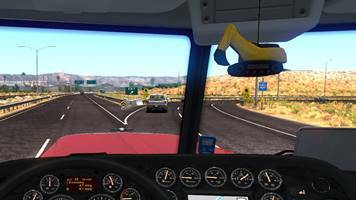 After receiving a few questions about how to redeem the prizes, how to get the skin and the plush toy after completing all 15 trips in the ATS Big Sur Special Event, I decided to post this article so everyone will know. If you don’t know about this event, check out this article ATS EVENT: BIG SUR REBUILD! and join us today! Right as I’m writing this on June 30, it’s been 5 days since the event started and we have done 217,000 deliveries. We’re almost half way there! 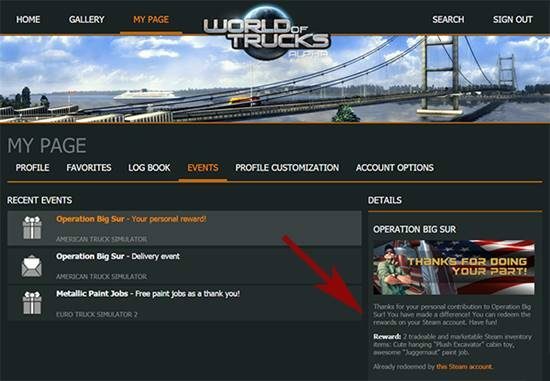 The way you redeem you plush excavator toy and skin is simple, after you’ve completed all 15 jobs, just log intro your World of Truck account here: https://www.worldoftrucks.com/, click on “MY PAGE” tab, go to “EVENTS” then there you should see a message Operation Big Sur– Your personal reward!. Click on that and on the right side you should see something like a redeem prizes link.